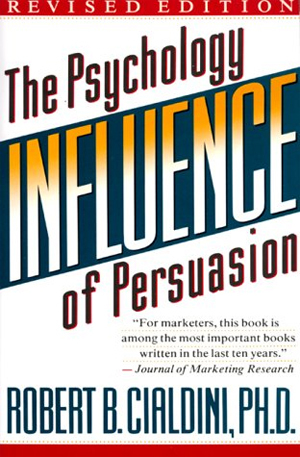 Influence: The Psychology of Persuasion is Cialdini’s best-selling pop psychology book. First published in 1984 (not without some irony, given its content), he wrote about a difficult subject using a very approachable style. A more recent version of this book, Influence: Science and Practice, while substantially the same, does offer some important differences, but those are discussed in my review of Influence: Science and Practice, not here. I’ll limit this review to the basic content of the original book. He brackets this discussion with an introductory chapter entitled “Weapons of Influence” and an Epilogue that discusses “Instant Influence.” All eight chapters (including the Epilogue) flow as if you were listening to a wise and helpful friend. A friend, that is, who retains an encyclopedic span of knowledge regarding psychological research studies. He doesn’t just tell a compelling story, he backs it up with hard research. But don’t let that “professor” title get you down. Even Cialdini’s footnotes offer a bit of humor (although it would have been more convenient to the reader had he placed them at the bottom of the relevant page rather than accumulate them in mass at the end of the book). But here’s the part of the book that speaks volumes to Cialdini’s desire to rid himself of his inability to say “No!” At the conclusion of the discussion of each category, he adds a “How to Say No” section followed by a “Reader’s Response” section. In the “How to Say No” portion, Cialdini offers specific strategies the reader can use to avoid being duped by the particular compliance tactic being addressed. The “Reader’s Response” segment offers an immediate case study testimonial by a reader showing an example of the compliance tactic in practice – often at the expense of the subject writing the response! It’s a great practicum of everyday occurrences that many people can relate to. Remember those old Charles Atlas ads? The ones where he tells the story of being a 98-pound weakling who got sand kicked in his face at the beach? And then where that 98-pound weakling undergoes a disciplined regimen to bulk up, return to that beach and kick sand in the other guy’s face? And how Charles Atlas, having discovered and successfully employed this regimen, now wants to share it with you? Well, Robert Cialdini is the Charles Atlas of persuasion. If you read this book, you’ll never get marketing sand kicked in your face again. Alas, altruism can never withstand the pressures of the marketplace. In Cialdini’s more recent book, “Mr. How-to-Say-No” crosses over to the Dark Side. You’ll to read my review of Yes! 50 Scientifically Proven Ways to Be Persuasive to discover why and how.